The majority of lengths come in 2200mm with some shorter lengths down to 1000mm. Our Planks & Parquet range is produced to order, so there will be a three week lead time. The St John’s Oak has been carefully designed to mimic the original floorboards in our sister company, deVOL Kitchens, showroom in St John’s Square, Clerkenwell. The walnut and umber coloured planks have dark, burned edges to give the illusion of the original varnish being worn away from years of footfall. The wood looks amazing against deVOL’s painted cabinets, and adds character and rustic charm to a room. Our planks come in generous lengths of up to 2200mm, with some shorter lengths ranging down to 1000mm, to create a truly beautiful floor. Our range of colours have been selected so that there is something to suit every project. 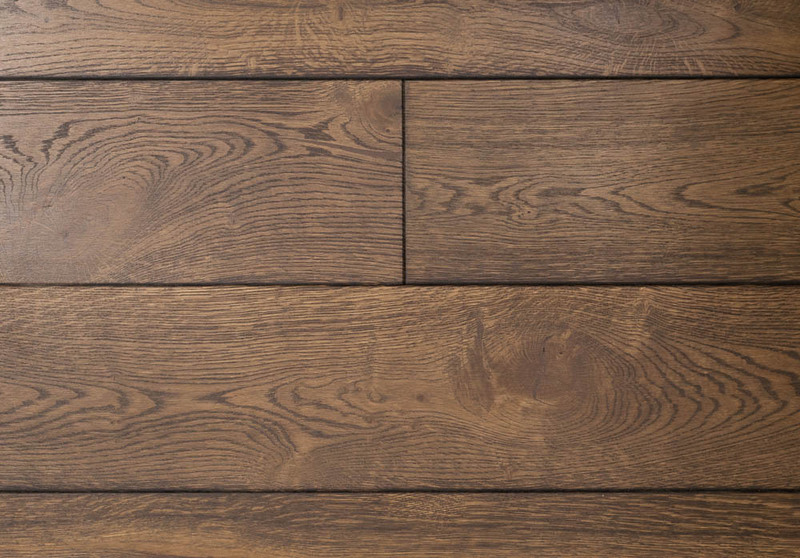 The planks are engineered from three layers of solid oak, making them more durable than other engineered wood floors and giving the dense, quality feel of a solid oak floor. All of our planks are all suitable for use over underfloor heating, with the solid wood make up giving the benefit that they retain the heat for longer. The planks come fully finished, so can be walked on from the day they are laid, making them hardwearing and easy to maintain.